Cancer genomes present unique challenges for analytical validation. Diverse variant types (SNVs, SVs, etc), tumor heterogeneity, and archival samples conditions (FFPE) contribute to more complicated genomic analyses in cancer than that of normal germline tissues. 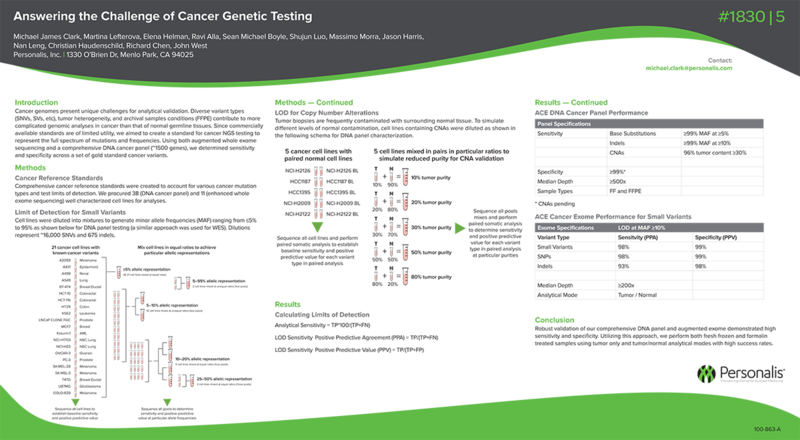 Since commercially available standards are of limited utility, we aimed to create a standard for cancer NGS testing to represent the full spectrum of mutations and frequencies. Using both augmented whole exome sequencing and a comprehensive DNA cancer panel (~1500 genes), we determined sensitivity and specificity across a set of gold standard cancer variants.